J. A. Lee Electric is one of the most highly respected electrical contracting companies in the Northeast. Since our first project in 1991, our philosophy has remained the same: we deliver quality workmanship, on time and in budget, exceeding our client’s expectations. As a member of the J. A. Lee family, J. A. Lee Electric draws on a full range of pooled resources, a benefit that differentiates J. A. Lee Electric from its competitors. Not only does J. A. Lee Electric have access to one of the largest staffs of qualified union personnel in the Northeast, it also has access to a large inventory of construction machinery and tools to get your job done quickly and affordably. J. A. Lee’s Electric field employees are members of the International Brotherhood of Electrical Workers (IBEW). In addition, J. A. Lee Electric is a member of the National Electrical Contractors Association (NECA), and the New York Electrical Contractors Association (NYECA). This strong IBEW/NECA connection provides our clients with uniquely trained, highly productive and safety oriented personnel. In this time of acute labor shortages, the availability of qualified crews is critical. J. A. Lee Electric can meet all your labor needs - a claim many contractors make but can not deliver like J. A. Lee Electric. The reason J. A. Lee continues to be successful in business is their commitment to forward-thinking. Experience doesn’t mean we are attached to old ideas. Whether it is the latest in know-how, installations or safety measures, J. A. Lee is always motivated to be ahead of the competition. J. A. Lee Electric are experts in Project Planning Services, from conception through completed construction. J. A. Lee Electric expert planning and implementation model allows us to deliver cost effective, time efficient quality projects to our customers. This technique presents the customer with an opportunity to interface with a single entity for all design, engineering and construction needs for the life of the project. Our experienced project management teams provide comprehensive plan development, scheduling and coordination which encompasses all aspects of the project from engineering, material procurement, and construction. J. A. Lee’s Electric quality assurance department ensures that all projects are completed with the highest level of quality and accuracy. The ability to properly plan and allocate the required construction crews is critical to the success of any electrical project. J. A. Lee Electric has the manpower, experience and ability to plan and schedule multiple work locations and programs. J. A. Lee Electric provides services for every aspect of field construction to make sure that all construction meets utility and/or jurisdictional specifications. Our objective is to properly plan and deliver a professionally completed project while maintaining the highest level of safe work conditions to the public and for our employees. J. A. Lee Electric is one of the Northeast’s premier consulting, engineering, project management and electrical construction firms. J. A. Lee Electric offers full service, multidiscipline, integrated engineering services and solutions to our clients – on time, within budget, safely and professionally. We have successfully delivered projects of all sizes in some of the most challenging conditions and environments. Our talented engineer and planners have a broad range of expertise and years of experience derived from many of the largest projects in the Northeast United States. Over the years, J. 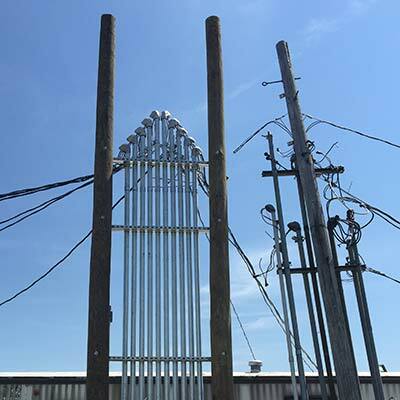 A. Lee Electric has successfully delivered projects of all sizes ranging from small-scale design-build to large-scale multi-million dollar projects and almost everything in between. Our approach is customer focused and our commitment is to value innovation and total solutions. J. A. Lee Electric provides exceptional expertise, the highest caliber of service and a passionate group of hard-working men and women who are dedicated to produce the best results possible. Our extensive portfolio of electrical services speaks to our vast experience in meeting and delivering creative solutions. While corporations have invested millions in redundant and mirrored systems, even the most robust information system is only as strong as the infrastructure that powers and protects it. This is why many of the nation’s most demanding data and communication companies depend on J. A. Lee Electric to assess mission-critical infrastructure and offer viable solutions and remedies. With the deployment of new equipment and technologies, power density is on the rise. Providing the power and the associated cooling for these complex systems are the two biggest challenges in communication centers and mission critical facilities today. Planning for enough capacity, while maintaining compliance with an ever growing amount of regulations has never been more important – downtime is not an option. Constructing a new facility or working in an existing critical environment requires detailed planning and implementation. Whether your facility has an existing procedure in place or needs assistance with development of procedures, our experienced staff has the expertise to provide solutions. J. A. Lee’s skill in development of alternative solutions to complex situations minimize risk and down time during the replacement and/or upgrade of critical systems. We take the right steps to ensure you have the highest level and quality of service. We follow safety procedures, use highly trained and qualified workers, and treat each site with care. The way we do business, and the high standards we set for ourselves is what makes us unique and sets us apart from the competition. This is why choosing J. A. Lee is the right choice.